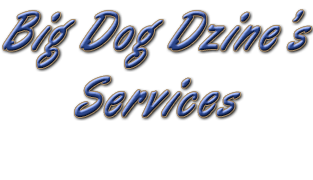 Services at Big Dog Dzine-Affordable Website Design! Create a Unique & Responsive Design for all Platforms and Screen Sizes. Create Wordpress Sites for Blogging and other forums. Create eCommerence Sites so you can Sell Online. Employ Google Analytics and Search Engine Optimization through content strategies. Submit Your Site to the Top Search Engines. Transfer Your Domain or Register a Domain for You. Provide Web Hosting for Your Site. Do Photography Enhancements and Embed Watermarks for Image Security. Make recommendations on Social Media Marketing to Help Promote Your Site. My Satisfaction Guarantee to you is that I will do everything possible to make sure you are happy with your website design. I do not require a deposit, or money up front. I will create a website design image for your approval. Once the website design is approved; I will create the website and put it online for your inspection. Only after you have given your approval will you website go live on its domain name. This is a collaborative process that requires a great deal of communication between us. The better our communication, the better the outcome. I look forward to working with you on your next website project. If you have any questions, Please Contact Me. ©2013-2015 Big Dog Dzine. All Rights Reserved.